Thymol is a natural active ingredient of plant origin used in veterinary medicine mainly in dogs and cats against some external parasites (lice, fleas, flies, etc). It is also used against agricultural and household pests. Mechanism of action: Little is known about the mechanism of action of thymol in insects. Certain studies in blowflies suggest that it acts upon the neuronal synapses blocking the production of neurotransmitters such as acetylcholine. Other studies on Drosophila melanogaster flies have also shown that it binds to GABA receptors and inhibits the enzymatic activity of cytochrome P450 and glutathion-S-tranferase. However, a "crushing" efficacy should not be expected from natural products, comparable to that of modern synthetic insecticides, which are more potent and persistent than any natural compound. Simplifying, it can be said that natural active ingredients can be useful in places or seasons with low parasite challenge, but may be insufficient for controlling well established parasite populations (fleas, ticks, mites, etc.) in pets, let alone in livestock. Efficacy against a specific parasite depends on the delivery form and on the dose administered. Check the labels of the products available in your country. Thymol may be a skin and eye irritant and cause skin sensitization. Being used as a preservative and flavoring agent in products for human consumption it can be considered as rather safe for use on humans and domestic animals. It must be remembered that the natural origin does not guarantee that such compounds are less toxic than the synthetic parasiticides. They are as "chemical" as the synthetic ones. Toxicity is a matter of dose! Thymol is the major component in the essential oils of several plants (e.g. Thymus vulgaris). More or less pure thymol is extracted industrially from such oils. But there are also processes for industrial synthesis. Use in public/domestic hygiene: ? Thymol is an aliphatic terpene naturally produced by numerous plants. It is one of the major components in the essential oils of thyme, marjoram and bergamot. Thymol is an optic isomer from carvacrol, i.e. it has the same chemical formula but with a different spatial structure. Many plants that contain carvacrol contain also thymol. 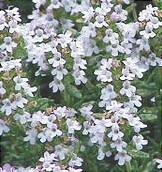 Thymol was first isolated in 1719. Its chemical formula was determined in 1853 and the first synthesis in the laboratory was achieved in 1882. As a constituent of thyme extracts, thymol was already used in ancient Egypt to preserve mummies due to its antimicrobial and fungicidal properties. Nowadays it is used moderately as a natural antiseptic in human and veterinary medicine (e.g. in dental hygiene), as a preservative in the food industry, and due to its pleasant odor also as fragrance in cosmetic products. For the time being it seems not to be used significantly in commercial veterinary antiparasitics. It is used in bees against Varroa mites. There are experimental studies showing a useful repellent effect against mosquitoes. Thymol shares two features with many other natural insecticides: it is rather volatile and is unstable when exposed to sunlight. Consequently its effect in animals exposed to sunlight is very short: a few days or even only a few hours. This means that protection of the treated animals against re-infestations (residual effect) is virtually inexistent. This is particularly unfavorable for livestock that would need to be treated very frequently. However, for the same reason they do not leave chemical residues in food commodities (meat, milk, eggs, etc. ), which is a benefit sought by organic producers. Another disadvantage of many "natural products" extracted from plants is that quality (and thus efficacy) may vary, even if used following the label instructions, because producing extracts from heterogeneous plant materials is often less reliable than chemical synthesis. Finally it must be said that in many countries registration of so-called "natural products" does not need a (serious) proof of efficacy, quality and safety as pesticides or veterinary medicines. This means that many such products have not been seriously tested in clinical trials in the field and consequently their efficacy and/or safety may not be granted. For such products, getting a market authorization does not need a substantial investment, which explains why there are so many brands in most countries. Click here to view the list of all technical summaries of natural antiparasitic active ingredients in this site. Click here to visit the article on medicinal plants with antiparasitic properties in this site.